1) School districts are now excluded from the 2.5% cap. There may be legal arguments that have some merit as to why this could not be done in HB2 as opposed to HB3, but I’m betting the POLITICAL arguments were the winning factor here. Chairman Huberty is the Lord of All Things Education; just look at his standing edict that no school choice bills will EVER get a hearing. so he had to be in control of that piece of HB2. And, while we am hearing SOME sort of voter approval rate will come out on schools in HB3, it WILL be weaker. We personally trust Burrows to be friend to the property taxpayers far more than Huberty. 2) Hospital and Special purpose districts now excluded. This will have MAJOR unintended consequences With hospital districts able to go up 8% without voter approval and counties limited to 2.5%, the counties will shove their healthcare budgets for indigent care off on the hospitals more and more. And Special districts will pop up like weeds for the express ability to tax at the FAR higher rate than cities without voter input. When you select ‘winners & losers’ in such a big way between types of government entities, you WILL shift power as well. 3) The ‘banking’ of unused rates for future use. This is a little more understandable to adjust for fluctuations in need, but will have the impact that- overtime- taxes WILL grow at the 2.5% rate, whether that much is needed or not. Bottom line; before, this bill had our strong support as a stand-alone piece of legislation. It no longer does It ONLY gains reluctant support IF HB3 ends up containing something CLOSE to the same voter approval REQUIRED rate. And some version of tax swap such as HB2914 now NEEDS to be a piece of the puzzle to be able to declare any kind of success for the property taxpayers this session. HB1 assures there can be no claim of success for fiscal sanity, for sure; we need a win SOMEWHERE for the taxpayers. Folks, these are the bills that will drive the fiscal train in the 86th Texas Legislature. Make no mistake, this session will NOT be cutting back on spending; indeed it looks like- despite a large increase in revenue- the ‘will of the bodies’ is to spend even more. Some of us are calling this session ‘Christmastime for Education’- and the education lobby appetite is insatiable. Currently, there ARE plans to control the growth of property taxes and to give some SMALL relief on property taxes (on the order of 4-8%). but these amounts are small enough, even if tax growth IS controlled, will likely see you through only 2-3 years before your property taxes are right back where they were. There IS one bill that is a tax SWAP proposal that would substantially drop school property taxes (averaging $1400); BUT at a cost in more things covered under sales tax, some of which are significant. More on that bill (HB2915) later. This is the bill to require that any overall property tax increase above 2.5% (whether through appraisal or rate) on existing property REQUIRES voter approval in the November elections. These twin bills have both been heard in committee and have had public testimony. SB2 had 15 amendments added, the most critical is to address the fact that the ‘Voter Approved Trigger’ in the original bill, only applies to government entities above $15 million in revenue. An amendment, added by Sen. Brandon Creighton that requires and ‘Opt-in’ election for those smaller entities in May of 2020. Rge House version of the identical bill with no amendments, had it’s committee hearing and, while nothing like Creighton’s amendment has yet to be added, things are being worked in the background to do something similar. Both committees (House Ways & Means under Rep. Burrows and The Senate Property Tax committee under Sen. Bettencourt) have done fine jobs with this bill that is essential to control tax growth, without which, any relief we may get will get swept away by the current ability to grow our property tax bill. But be warned, backroom shenanigans are ongoing. Talk of the Senate only having 15 votes of the 19 they need (rural GOP Senators berated into submission by county officials) and that anything that passes will be in the 4% range- and NOT include smaller entities, pretty useless to most property taxpayers to have a say in increases. If you’re a taxpayer advocate in a rural GOP senator’s district, get on the phone and let them know, you want a voter’s voice in a property tax increase above 2.5% in ANY government entity. This bill is a done deal in terms of coming out of the House; it already has a bipartisan super-majority of co-authors. It’s $9.3 billion ‘extra’ spending: $6.3 for education and $2.7 billion for property tax relief. The Education money has SOME direction to it’s usage, but it leaves a LOT of discretion to the administrators in implementing that direction. There is a component of it for administration managed merit pay incentives that the teacher groups l hate (and I expect it to be killed on the floor). The Education lobby wants it all based only on seniority, no matter how bad or good they are at their job. The districts can also use the extra money to give raises to OTHER employees, from bus driver to- administration. The Senate came up with a straight $5,000 more per teacher or librarian but the complaint there was it ‘lacked flexibility for the districts to decide what is best’. I suggest you check you superintendents salaries today- and see where they are in 2 years. The Senate’s equivalent to HB3 is a incoherent assemble of a few bills with little detail; the House version will like drive this part. There is ‘some property tax relief’ in SB3: a reduction of 4 to 8 cents per $100, depending how absurd your current overall rate is. On a $275K home with a $25K homestead exemption, that’s in the $100-$200 range. Easily negated with a single year’s appraisal growth not- or 2-3 years worth, if HB2 passes depending on the number assigned. For REAL relief, we need a number approaching or in the 4 digit range. A 6 Billion Supplemental appropriation proposal that has passed the Senate unanimously. It takes $4 Billion from the Rainy Day Fund, then applies $3 billion of it- appropriately- to Harvey recovery efforts. But then uses over a billion of the reserve for ongoing expenses. Even with very LARGE increases in revenue for this biennium, they still feel the need to tap reserves? This broke the inflation + population growth ceiling in spending and got a negative rating by multiple fiscally conservative groups Still got a unanimous vote; fiscal responsibility has been chucked out the window. The House is pretty well set to do the same or worse with their supplemental ideas; and expect the conference committee not to help things back to fiscal sanity. This is the one bill here that does not yet have strong leadership support- but we need to promote it to see if we can get it. 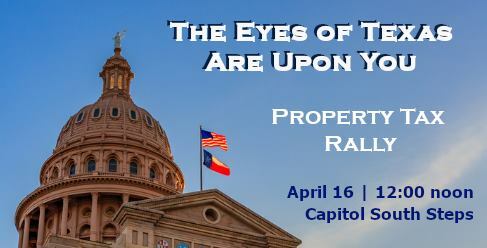 Again, it is not OVERALL relief but a taking some of the current overburden on the property taxpayer and spreads it to a larger base by expanding the sales tax to cover MANY items that currently are exempt, excluded or fall through loopholes. The relief proposed? a 10 cent reduction in the school Maintenance & Operations piece, AND homestead exemption set to 50% of your house value (up to a reasonable level). Plus some to allow a 100% commercial retail inventory exemption for business. The average homeowner would be saving $1400 of their property taxes- and that’s enough to let many keep their homes & younger buyers to invest in home ownership. The COST of the relief is, of course, the same. So what is available to apply sales taxes on that currently don’t face them? A large number of items, enough to raise 3 times what is needed if you put it on everything. But they range from political suicide (basic foodstuffs; ‘You’re ripping food from the mouth of babes!’) to slam dunks (Comptroller is going to start collecting sales taxes on out-of-state online purchases, an amount not yet allocated anywhere). In discussion with the Author’s office Rep. Drew Springer, they did not want the full list posted yet, as it is a work in progress. But there ARE major items currently being considered that will initially make people cringe: gasoline, for example & utility bills. But beauty of this approach is it is highly flexible to picking & choosing revenue sources and sizing the property tax benefit. For example, you could pull fuel from the sales tax poll (the biggest item) and eliminate the 10 cent reduction, but keep the 50% homestead exemption. It’s a highly workable approach for tuning though the process. A process we hope to get leadership to buy into and to advance the cause (Since they clearly are NOT going to ‘cancel Christmas’). We could really use some grassroots advocates pitching this bill to their reps, asking them to sign on and/or get involved in the mix of things included. Hopefully, this explanation, from the viewpoint on the ground who is in the thick of it as a volunteer taxpayer advocate. This all is a lot to digest and not sure every number is exactly right. But this is the layout of the battlefield. It ain’t pretty, but it is what it is. HB 378 (Lang) – Verification of citizenship to vote, in cases where a driver’s license did not have citizenship verification. HB 1104 (Meza) – Massively expands absentee ballot by mail. Mail-in ballots are subject of major fraud via ballot harvesting. So many important bills and a LOT of grassroots people coming down (and we need as MANY as possible to come). Here is a listing of the more important ones for freedom and fiscal sanity. Lots of advocacy needed to combat the Professional Political Class this week. Time to saddle up & ride, property taxpayers! It is absolutely critical we get a BIG turnout of taxpayers to testify at this one. 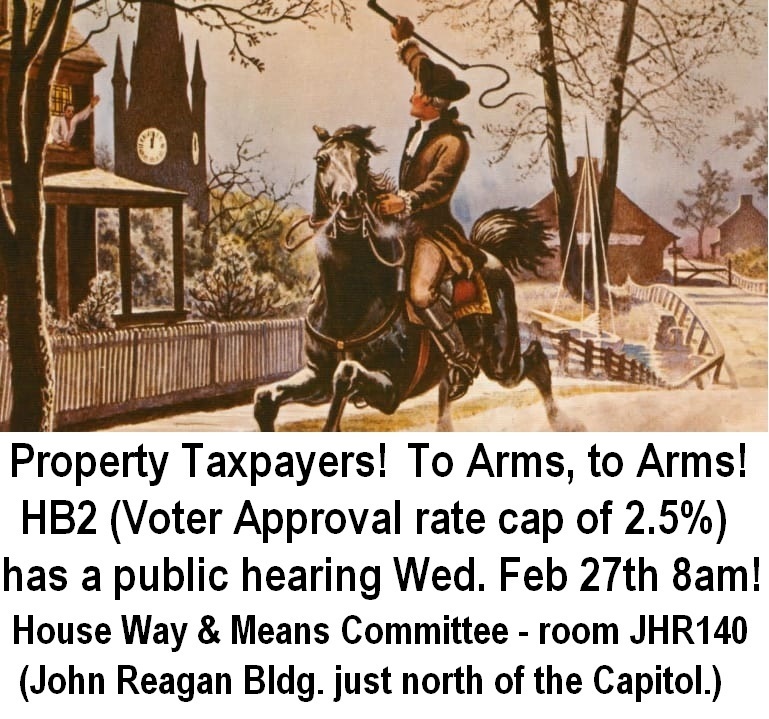 Many local government officials and the lobbyists they hired with YOUR money to work against you realized that they would not get far with the Senate Property Tax committee, so they didn’t put in the big effort there, But they WILL in the House Ways & Means committee; expect lots of shiny first responder uniforms to be present to claim HB2 will take cops of the streets & empty out firehouses. So we need an even BIGGER property taxpayer turnout at this meeting. We need people to bring WRITTEN testimony if they can; only 1-2 pages detailing their struggles with property tax growth- either in numbers or personal story. If they DO have written testimony, try to email it to the committee office by Tuesday am at paige.higerd_HC@house.texas.gov and let them kill the trees for you. Be sure your name and city are listed at the top, so they can locate it when you testify. No this is NOT property tax RELIEF, except in a future sense. It is a mechanism to control the GROWTH of property taxes and to put voter in more direct control of that growth. It is ABSOLUTELY essential that this piece get great support, because the bills coming later with actual relief for property taxpayers would be meaningless, if the appraisal growth could be used to ‘swamp’ any specific property tax reduction in a couple of years. We need the grassroots there and knowledgeable in the issues at hand. In the lists below, our ‘BEST friends’ are in bold; the others need various levels of ‘selling’. Democrats are italicized but don’t pass on ‘selling’ them as well. Cole & Rodriguez are from Travis county & their communities are being DECIMATED by rising property values & taxes. A lot of folks may not have had to testify in the John Reagan building before. 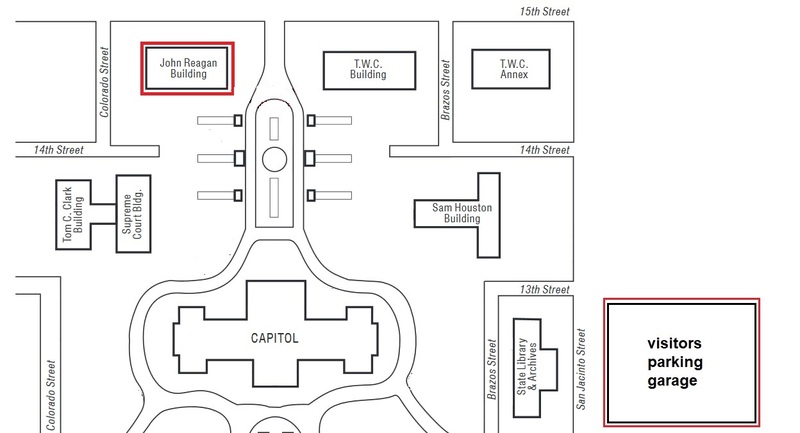 it is located to the NORTH of the capitol on the map below, Need to approach the main intrance from the GROUND level. The tunnel in E1 requires a badge, apparently (My apologies for directing some folks that way earlier.